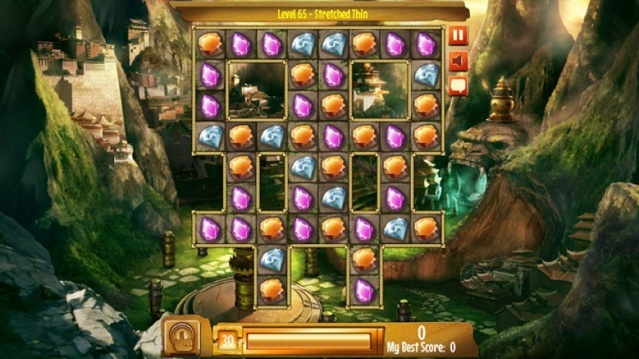 Developed by PlayEveryWare and published by iWin games, Jewel Quest is a simple yet highly challenging match-three style puzzler that will test your skills and can be a decent amount of fun for short-bursts, however how does it hold-up against its competition? Continue reading to find out! 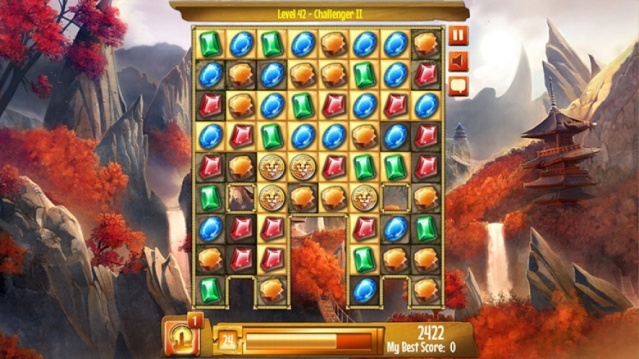 The gameplay in Jewel Quest is simple, you must match three or more jewels to make matches to light up the puzzle board. The objective is to light up every space on the board within a set amount of time. The puzzle boards get progressively more difficult with each stage that's cleared and gets extremely challenging near the end of the 72 stages. You can also match three or more coins to earn a wildcard to light up a single puzzle square to help complete the stages! The touch-screen controls are perfect for this kind of game and are also very easy to master which is good, since precision and speed are necessary for completing the more challenging stages in the game! The Off-TV-Play is also implemented well in this game so expect some quality audio and visuals even if you don't always have access to a television set! Visually the game is a mixed bag, the background images in the stages are quite detailed and look nice, however the jewels and puzzle boards look very dated and are missing that HD shine which is very unfortunate, the audio on the other hand is nice with simple sound effects and an excellent soundtrack that definitely sets the mood for the game! Overall the audio-visual presentation is above average if you take everything into account! 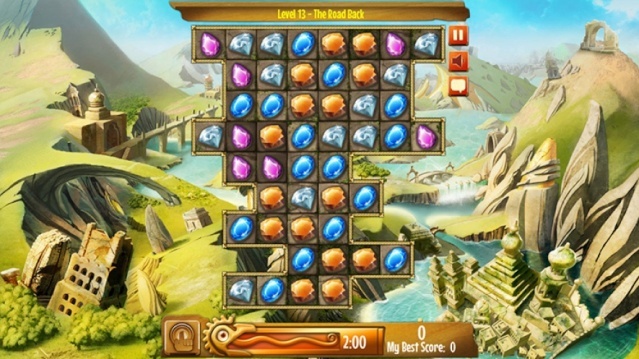 With solid gameplay that's both simple yet extremely challenging, flawless controls that work well with the game, and a superb soundtrack, Jewel Quest is a game that most fans of the puzzle genre will likely find quite enjoyable, however the visuals aren't on par with most modern games in the genre and as such it does slightly hurt the game's overall score. Regardless we still give Jewel Quest a solid level of recommendation to our fans! Our 499th review is now live! Good review. Now if only Taito would release a new Bust A Move game on the Wii U eshop. @Gekkouga-Senpai What an awesome avatar you have! On topic nice review @Ichigofan.